In the past I’ve posted on inter-linking and cross promotion and today I want to expand on that with a little cross promotion when you are linking out to other blogs via your social networks. 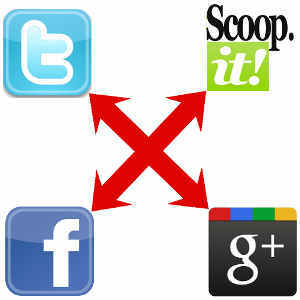 Your Thoughts On Cross Linking Via Social Media Accounts? I want to thank Michael Q Todd for reminding me of this basic method of expanding our reach. Michael has setup a very cool subscription based support/sharing group, Change Agents via Social Media, on Facebook to master Facebook’s EdgeRank. I recently spoke with Michael via a Google Hangout and he recommended that I use ScoopIt (Follow me there) when promoting other member’s blog posts on the social networks (Link directly when using your own blog). So when I want to share the posts of other members on Facebook, I simply “Scoop It” and then use that ScoopIt URL on Facebook and across the other social sites. This is another form of cross promotion and helps all parties involved. My Scoop It following grows and the posts of the other bloggers get that much more exposure. I found a very impressive guy on YouTube and I wanted to learn more about him. As soon as I watched his energy and excitement on a YouTube video I sent Sheryl a Tweet saying I thought he would do very well. Then I ran a quick search to find his site and that is where I found the tweet embedded above. That search led to this blog post today. @SherylLoch I predict that this guy is going to do very well on YouTube http://t.co/SZism2M4Ob Watch his excitement. By the way, that little search I ran on hipset? That search brought up, along with Robert Scoble’s links, an article about Hipset on Forbes, TechCrunch, and a bunch of other favorable links. So, yeah, that YouTube channel should grow pretty fast if they keep the momentum up. Right now there are only five videos in two days with 103 subscribers and 2214 video views [UPDATE 24 Aug. 2014: 2,357 Subscribers]. We’ll check back later and update the stats and see how well they’re doing. Are you using this method of cross promotion? Can you see any benefit to it? Do you think it’s just too much work? What types of promotion do you use to grow your social media accounts? Some bloggers prefer to keep everything separate with different followers on each account. I’m interested in your thoughts on the matter.